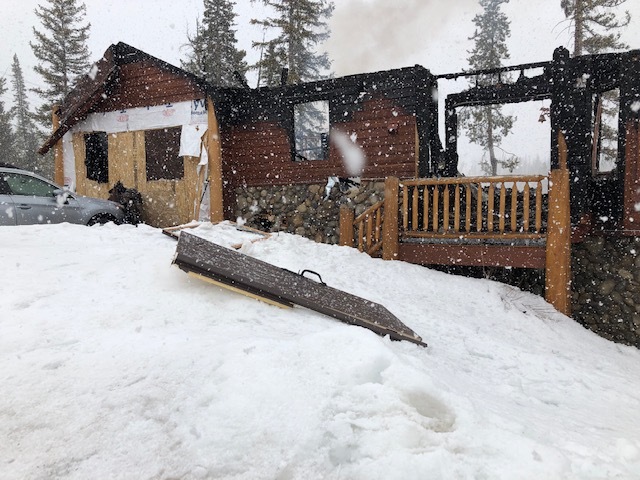 GRAND COUNTY, Colo. – A woman was killed and her husband was injured following a home explosion near Grand Lake early Sunday morning. The initial call came in to the Grand County Communications Center at 12:39 a.m., regarding a structure fire and explosion on Mad Moose Lane. First responders “quickly learned the house was a total loss,” according to a statement from the Grand County Sheriff’s Office posted on Facebook. He said the male victim, later identified as 63-year-old Mark McLean, was thrown from the house and landed in the back yard, out in the snow. The female victim, later identified as 66-year-old Susan (Ann) McLean, was thrown onto the deck. She did not survive. Mr. McLean was driven by ambulance to a burn center in Denver where he is listed in critical condition. The explosion on Mad Moose Lane was felt throughout the neighorhood. Residents are still coming to terms with the loss of one of their neighbors and injury to another. Roubidoux said his son woke him up and told him the McLean’s house was on fire after a friend, who was over watching movies, heard the explosion. He said by the time he got dressed and went outside, fire crews were arriving on scene, and the house was ablaze. Investigators have determined the origin of the explosion and fire, but not the exact cause. Lt. Mayer said it appears to have started in the back of the house near a hot water heater. A front-end loader was park just a few feet away. “The homeowner was apparently doing some renovation and excavation,” Mayer said, adding that investigators are trying to determine if a gas line had been cut. “We don’t suspect foul play,” he said. Mayer said the explosion was so powerful, it blew one wall about 200 feet away. “Even some artwork from inside the house was shot up into the trees,” he said. Mayer said the front door was blown clear out into the front yard. Early Sunday evening, a hot spot in the middle of the house flared up, sending thick smoke skyward as snow fell. Fire crews returned to the scene to douse the flames. Mayer said it was a tough fire to fight overnight. As temperatures dropped, the water froze on the ground, and a couple of firefighters slipped and fell. A couple were treated for smoke inhalation. The injuries appeared to be minor and the firefighters are OK.
“Our condolences go out to the McLean family and entire Grand Lake community during this tragic time,” Mayer said.